Thank you for supporting the Healthyfellows / Man Enough Support Initiative’s Mustache & Beard Competition. Your donation will support our continued effort to improve health of men. The Man Enough Support Initiative’s Face-Off Mustache & Beard Competion exist as an annual fundraiser designed to raise money to support programs working to improve the health and wellness of men. It is our goal to support the work of area program who are addressing health disparities. Man Enough Support Initiative will give 100% of the donations to support the work of one area agency. This year the MESI has selected the Curtis D. Robinson Men’s Health Institute (Curtis D. Robinson Center for Health Equity), in Hartford, as our 2015 recipient. The Curtis D. Robinson Men’s Health Institute exist to improve patient education, early detection, appropriate treatment, access to the most advanced treatment options, and continued support for men at risk of prostate cancer. The Curtis D. Robinson Center for Health Equity is dedicated to serving our community for optimal health through education, research, engagement, and health advocacy. 1. The Face-Off Mustache & Beard Competition is open to all competitors, regardless of the competitor’s enrollment status at CCSU(e.g., undergraduate, graduate, full /part time, etc.). The competition is open students and the greater public. 2. The competition will take place in three (3) categories. Each competitor will specify the category in which he wishes to compete when he registers. A Scholarly beard includes, but is not limited to, stylish, glamorous facial hair (e.g., goatees, sideburns, and (or) full length beards that display a profession or intellectual look. This category includes whiskers fashionable beards or mustaches. The use of styling aides is prohibited. Category examples: Sigmund Freud, Carl Marx, Usher, Tom Selleck, Brad Pitt, Albert Einstein, Colonel Sanders, Johnny Depp, Shemar Moore, etc.). The Unique category exists as a broad category with limited restrictions for beard or mustache presentations. Competitors are free to style their whiskers naturally or creatively display the facial hair with the use of styling aids (e.g., wax, hair spray, lacquer, gel, styling foam, etc.). The use of hair extensions and (or) artificial facial hair is not permitted. Category examples: Groucho Marx, Gene Shalit, Charley Chapman, Captain Hook, Wild Bill Hickok, Geraldo Rivera, Mr. T, Iron Sheik, Hulk Hogan, Chris Noel, Shavo Odadjian, etc.). The Rugged or manly beard category exists for those guys who want to display the alpha side of their personality. This category exists for those who want their whiskers to symbolize their masculinity. The Rugged beard is rustic and unpolished. It is facial hair that is allowed to grow in its natural form. Category examples: Willie Nelson, Morgan Freeman, ZZ Top, Duck Dynasty, Red Foxx, Paul Teutul Sr., Fidel Castro, Robbie Coltrane as Rubeus Hagrid, Jack Passion, Bob Marley, Sam Elliot, etc.). 4. Each competitor must submit a Registration, Pledge Form, and the donations they collected. 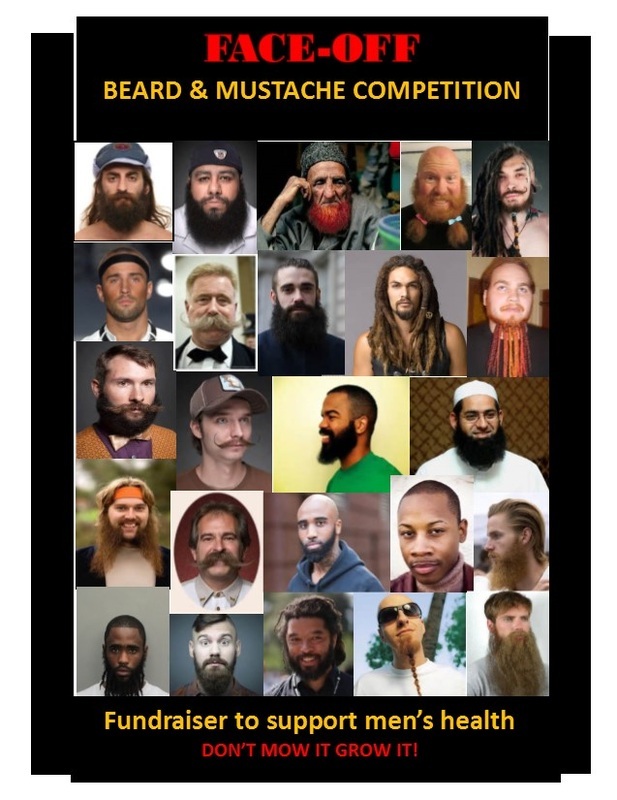 Each competitor must appear for a “pre-judging” prior to the date of the competition with their facial hair styled as it will be for the competition. Any competitor who does not meet the qualifications for the category he has entered will be placed into a different category where he does qualify. 5. By registering for the competition, all competitors give their permission to be photographed, videotaped, and tape recorded. The materials will be used to document the event and used for future promotion activities. Any competitor who does not agree to this provision must notify the organizers in writing before the start of the competition. 6. Depending on the number of contestants in each category, the judging in some categories will include an elimination round and a final round. 7. The competition will consist of three rounds. During the first round, the photographs of each of the competitors will be judged by the CCSU campus community. Competitors will be evaluated on a point scale (0-10) on each of the three criteria areas. Only whole numbers will be used in the tabulation process. Each category has three criteria areas the evaluator will use to rate the competitor’s mustache or beard. Each evaluator will vote for three competitors in each category. The three competitors receiving the most votes, in each category will advance to the final round. In the case of a tie for either first, second, or third place, all competitors with the same number of votes will advance to the finals. The three highest scores in each category will advance to the elimination round. 8. The elimination round will exist at a formal ceremony. Any competitor who does not appear when notified will be eliminated from the competition. During the elimination round, the Judges (e.g., selected group of individuals) will select the top competitor in each of the three (3) categories. 9. The finalist from the elimination round will compete for “Best-in-Face”. Any competitor who does not appear when called to the stage will be eliminated from the competition. In the final round, each Judge will rank the top three competitors in each category. A first place vote is worth five points, a second place vote is worth three points, and a third place vote is worth one point. The contestant with the highest number of points wins the elimination round or “Best-in-Category”. In the event of a tie for any of the first three places, the judges will be asked to revote among the tied competitors. 10. During the final competition event, the audience will select the overall winner. Trophies will be awarded to the top three overall finalists (1st, 2nd, and 3rd). The audience will complete a ballet and write in the name of the individual they believe deserves the overall status as “Best-in-Face”. The second the third place finalist will be selected in order of the number of votes received. 11. The organizers reserve the right to modify these rules at any time. Any rule modifications will be announced publicly before the competition begins. 12. All decisions of the judges and organizers are final. 13. The judges will be required to take an oath to be impartial. The judges will receive no information regarding judging except for the official judging criteria which are available to the public. 14. Discourteous, abusive, or unprofessional behavior by a contestant may lead to disqualification at the organizers’ discretion. 15. The results of the judges’ voting will be made public during the competition.